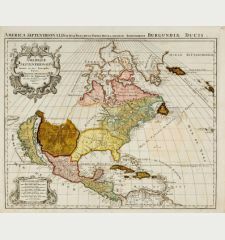 Coloured map of the American continent. Printed in Venice by G. Rosaccio in 1598. 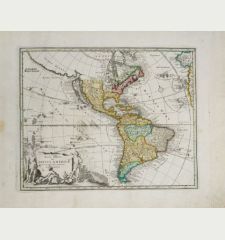 Coloured copper engraved America Map of G. Ruscelli. 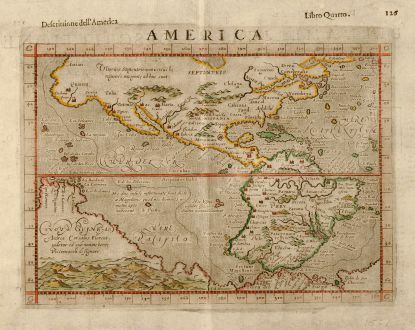 This example has a thin unexplained engraved line around the continent. From Ruscelli's Ptolemy Geographica "Le Relationi Universali" published first 1595 in Venice. Professionally cleaned and strengthened, slightly plate toned. Very good condition. 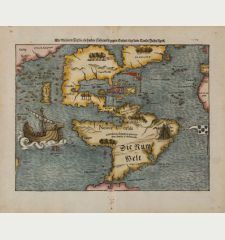 Girolamo Ruscelli, an Italian Alchemist, physician and cartographer, was born around 1504 in Viterbo. 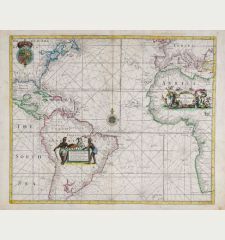 He has revised the Ptolemy Geography, which was issued from 1561 until 1599 in Venice. 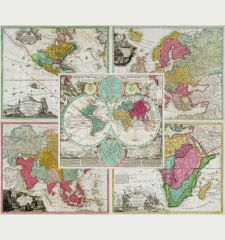 The new copper engraved maps are based on G. Gastaldi's edition of 1548. He died 1566 in Venice.